After years of goaltending futility, the Tampa Bay Lightning look to finally have some wealth at arguably hockey’s most important position. 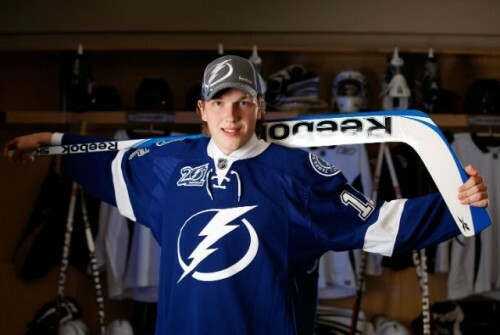 That comes courtesy of highly touted prospect Andrei Vasilevskiy who, despite having numerous KHL offers sent his way, chose to sign a three-year, entry-level deal with the Lightning on May 6th, 2014. He had to wait a little while for his North American debut though. While fellow prospect Kristers Gudlevskis was making history by becoming the only player to compete in the ECHL, AHL, NHL, Olympics and IIHF World Championships during the same season, Vasilevskiy was busy proving himself. First with Salavat Yulaev Ufa of Russia’s professional hockey league, then helping lead his country to a gold medal at the World Championships this past spring. Finally, Vasilevskiy got his shot in Tuesday nights preseason opener versus the Nashville Predators. It wasn’t picture perfect but he kept the Lightning within striking distance, saving 28 of 30 shots against. His reward: a win, as the team erased an early third period deficit to win 4-2. Unfortunately, that likely won’t win him a job with the big club straight out of training camp. Not with Ben Bishop cemented as the Bolts number one goalie and Evgeni Nabokov signed through this season to provide insurance. Instead, Vasilevskiy will probably battle Gudlevskis for the starting role in Syracuse. Should he perform well, a call up might be possible. Even if that doesn’t occur, a strong camp and AHL campaign could go a long way in determining his fate for the 2015-2016 season. Does he have the ability to be an elite goaltender in the NHL somewhere down the road? Though that’s a prediction I’m not yet ready to make, it looks like the sky’s the limit for Vasilevskiy. Just look at Tuesday nights debut for proof.